"Treasure (Whatever Happened to Pete the Chop)"
(1983) "Two Hearts Beat as One"
"New Year's Day" is a song by Irish rock band U2. It is the third track on their 1983 album War and was released as the album's lead single in January 1983. With lyrics written about the Polish Solidarity movement, "New Year's Day" is driven by Adam Clayton's distinctive bassline and the Edge's piano and guitar playing. It was the band's first UK hit single, peaking at number 10, and was also their first international hit, reaching for number 9 in Norway, number 11 on the Dutch Top 40, number 17 in Sweden, and number 53 on the Billboard Hot 100 in the United States. In 2010, Rolling Stone magazine placed the single at number 435 on their list of "The 500 Greatest Songs of All Time". This song was also included in the Pitchfork 500. The lyric had its origins in a love song from Bono to his wife, but was subsequently reshaped and inspired by the Polish Solidarity movement. The bassline stemmed from bassist Adam Clayton trying to figure out the chords to the Visage song "Fade to Grey" during a soundcheck. In 1983, Bono said of the song, "It would be stupid to start drawing up battle lines, but I think the fact that 'New Year's Day' made the Top Ten indicated a disillusionment among record buyers. I don't think 'New Year's Day' was a pop single, certainly not in the way that Mickie Most might define a pop single as something that lasts three minutes and three weeks in the chart. I don't think we could have written that kind of song." "New Year's Day" is U2's seventh most frequently performed live song, with the Edge switching back and forth between piano and guitar during the song. It has been a standard on every U2 tour since its debut on 1 December 1982 at the first show of the War Tour's Pre-Tour, however the recent Innocence + Experience tour only featured three performances of the song for the entire tour. During the 1980s, the Edge used a Fender Stratocaster to perform this song, along with a keyboard. During the 1990s and 2000s (decade), he has alternated between a Gibson Les Paul Custom and Les Paul Standard. The Les Paul the Edge used to write this song was sold for charity. Up until the Elevation Tour, Clayton normally used a chorus effect on his bass guitar for this song live. In the Top of the Pops performance, Bono is seen playing guitar. "New Year's Day" has appeared on many of U2's concert video releases including 1983's U2 Live at Red Rocks: Under a Blood Red Sky, Zoo TV: Live from Sydney, PopMart: Live from Mexico City, U2 Go Home: Live from Slane Castle, Vertigo 2005: Live from Chicago, Live from Paris, and U2 3D. The B-side of "New Year's Day", "Treasure (Whatever Happened to Pete the Chop? )", was never performed live. However, an early version known simply as "Pete the Chop" was played at some concerts in 1980. During the Vertigo Tour at Silesian Stadium in Poland a quite remarkable example of fan action occurred. During "New Year's Day", the lower sections of the crowd waved red coloured items while other sections waved white, creating the Polish flag and stunning the band. This was repeated during the U2 360° Tour at the same venue. The video was one of their first to see heavy rotation on MTV. It was filmed in Sälen, Sweden in December 1982 and directed by Meiert Avis. The band only appeared in the performance scenes of the video as it was filmed in the dead of the Swedish winter. U2 guitarist Edge revealed in the official U2 biography that the four people riding on horseback in the video that appeared to be the four U2 members were in fact four Swedish teenage girls disguised as the members of U2 riding on horseback with masks over their faces. This was done as the band were frozen from shooting the video in sub-freezing temperatures the day before. Their biography states that Bono refused to wear any headgear despite the cold weather and had a lot of trouble mouthing the lyrics. The video also features footage of Soviet troops advancing in winter during World War II. The video made its debut UK television broadcast on Friday 31 December 1982, on the Channel 4 music programme The Tube. U2 allowed free-of-charge use of this song in a spot prepared by the European Commission. This clip published on YouTube shows a transformation of Poland in the last 20 years mixed with short scenes from today's Warsaw seen from a perspective of a 20-year-old woman. In 2001, dance act Musique released a remix of the song, "New Year's Dub". The remix charted in some European countries, including in the UK and in Ireland, where it peaked at no. 15 and no. 13, respectively. It also charted in Australia, where it peaked at no. 74. ^ "U2 > Discography > Albums > New Year's Day". U2.com. Retrieved 3 January 2018. ^ Barton, David (19 December 2015). "Rockin' harder than ever". Honolulu Star-Bulletin. p. D9. ^ "500 Greatest Songs of All Time: 435 – U2, 'New Year's Day'". Rolling Stone (Special collectors edition). 2010. Retrieved 8 June 2014. ^ Suddath, Claire (26 November 2008). "The Pitchfork 500". Pitchfork Media. Time. Retrieved 16 July 2013. ^ Perricone, Kathleen (19 October 2011). "Child who appeared on U2 album covers for 'Boy,' 'War' all grown up 31 years later". New York Daily News. Retrieved 3 January 2018. ^ Stokes, Niall (1996). Into the Heart: The Stories Behind Every U2 Song. HarperCollins. ^ Hilburn, Robert (8 August 2004). "Where Craft Ends and Spirit Begins". Los Angeles Times. Retrieved 16 January 2014. ^ Egan, Barry (16 January 2011). "Achtung baby, Adam is the proud father of a little boy". Sunday Independent. Retrieved 16 January 2010. ^ Thrills, Adrian (26 February 1983). "War & Peace". NME. Archived from the original on 17 July 2011. Retrieved 20 July 2017. ^ Mühlbradt, Matthias; Axver, André. "All songs U2 played without snippets - U2 on tour". U2gigs.com. Retrieved 7 June 2017. ^ Mühlbradt, Matthias; Axver, André. "U2 London, 1980-07-13, Marquee Club, Early Days - U2 on tour". U2gigs.com. Retrieved 16 July 2013. ^ Mühlbradt, Matthias; Axver, André. "U2 Chorzow, 2005-07-05, Slaski Stadium, Vertigo Tour - U2 on Tour". U2gigs.com. Retrieved 16 July 2013. ^ Mühlbradt, Matthias; Axver, André. "U2 Chorzow, 2009-08-06, Slaski Stadium, 360° Tour - U2 on Tour". U2gigs.com. Retrieved 16 July 2013. ^ Lightbody, Gary (9 August 2009). "'Something I've Never Seen Before'". Goyb.u2.com. Retrieved 16 July 2013. ^ "U2 Chorzow 2009-08-06 New Years Day GA camera - U2gigs.com". YouTube. Retrieved 16 July 2013. ^ "'New Year's Day'". U2.com. 31 July 2009. Retrieved 3 January 2017. ^ "A spot prepared by the European Commission". YouTube. ^ "Forum – ARIA Charts: Special Occasion Charts – CHART POSITIONS PRE 1989, part 2". Australian-charts.com. Hung Medien. Retrieved 8 June 2014. ^ "Ultratop.be – U2 – New Year's Day" (in Dutch). Ultratop 50. Retrieved 8 June 2014. ^ "Top RPM Singles: Issue 6323." RPM. Library and Archives Canada. Retrieved 16 July 2013. ^ "Accès direct aux Artistes (U)" (in French). InfoDisc. Select "U 2" from the artist drop-down menu. Retrieved 7 May 2017. ^ "The Irish Charts – Search Results – New Years Day". Irish Singles Chart. Retrieved 8 June 2014. ^ "Nederlandse Top 40 – U2 - New Year s Day" (in Dutch). Dutch Top 40. Retrieved 8 June 2014. 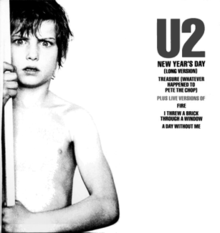 ^ "Dutchcharts.nl – U2 – New Year's Day" (in Dutch). Single Top 100. Retrieved 8 June 2014. ^ "Charts.nz – U2 – New Year's Day". Top 40 Singles. Retrieved 8 June 2014. ^ "Norwegiancharts.com – U2 – New Year's Day". VG-lista. Retrieved 8 June 2014. ^ "Swedishcharts.com – U2 – New Year's Day". Singles Top 100. Retrieved 8 June 2014. ^ "Official Singles Chart Top 100". Official Charts Company. Retrieved 16 July 2013. ^ "CASH BOX Top 100 Singles: Week ending MAY 21, 1983". Cash Box. Archived from the original on 11 September 2012. ^ a b "U2 – Awards". AllMusic. Retrieved 16 July 2013. ^ "50 Back Catalogue Singles – 2 October 2010". Ultratop. Hung Medien. Retrieved 16 July 2013. ^ "Forum – ARIA Charts: Special Occasion Charts – Chart Positions Pre 1989 Part 4". Australian-charts.com. Hung Medien. Retrieved 8 June 2014. ^ "The Irish Charts – Search Results – New Years Dub". Irish Singles Chart. Retrieved 8 June 2014. ^ "Indice per Interprete: U" (in Italian). Hit Parade Italia. Creative Commons. Retrieved 8 June 2014. ^ "Dutchcharts.nl – Musique vs. U2 – New Years Dub" (in Dutch). Single Top 100. Retrieved 8 June 2014. ^ "Swisscharts.com – Musique vs. U2 – New Years Dub". Swiss Singles Chart. Retrieved 8 June 2014. ^ "Official Singles Chart Top 100". Official Charts Company. Retrieved 8 June 2014. New Year's Day" video at MTV.com Only viewable in the United States.